According to data released by NASA and NOAA this month, April was the warmest April globally on record. Here are the data for NASA’s analysis; here are NOAA data and report. The two agencies have different analysis techniques, which in this case resulted in slightly different temperature anomaly values but the same overall rankings within their respective data sets. The analyses result in different rankings in most months. The two techniques do provide a check on one another and confidence for us that their results are robust. At the beginning, I will remind readers that the month-to-month and year-to-year values and rankings matter less than the long-term climatic warming. Weather is the dominant factor for monthly and yearly conditions, not climate. April’s global average temperature was 0.73°C (1.314°F) above normal (14°C; 1951-1980), according to NASA, as the following graphic shows. The past three months have a +0.63°C temperature anomaly. And the latest 12-month period (May 2013 – Apr 2014) had a +0.62°C temperature anomaly. The time series graph in the lower-right quadrant shows NASA’s 12-month running mean temperature index. The 2010-2012 downturn was largely due to the last La Niña event (see below for more). Since then, ENSO conditions returned to a neutral state (neither La Niña nor El Niño). As previous anomalously cool months fell off the back of the running mean, the 12-month temperature trace tracked upward again throughout 2013 and 2014. Figure 1. Global mean surface temperature anomaly maps and 12-month running mean time series through April 2014 from NASA. According to NOAA, April’s global average temperatures were +0.77°C (1.386°F) above the 20th century average of 13.7°C (56.7°F). NOAA’s global temperature anomaly map for April (duplicated below) shows where conditions were warmer and cooler than average during the month. Figure 2. Global temperature anomaly map for August 2013 from NOAA. The two different analyses’ importance is also shown by the preceding two figures. Despite differences in specific global temperature anomalies, both analyses picked up on the same spatial temperature patterns and their relative strength. Figure 3. Time series of weekly SST data from NCEP (NOAA). The highest interest region for El Niño/La Niña is `NINO 3.4` (2nd time series from top). There has been neither El Niño nor La Niña in the past couple of years. This ENSO-neutral phase is common. As you can see in the NINO 3.4 time series (2nd from top in Figure 3), Pacific sea surface temperatures were relatively cool in January through March, then quickly warmed. This switch occurred because normal easterly winds (blowing toward the west) across the equatorial Pacific relaxed and two significant westerly wind bursts occurred in the western Pacific. These anomalous winds generated an eastward moving Kelvin wave, which causes downwelling and surface mass convergence. Warm SSTs collect along the equator as a result. These Kelvin waves eventually crossed the entire Pacific Ocean, as Figure 4 shows. Figure 4. Sub-surface Pacific Ocean temperature anomalies from Jan-Apr 2014. Anomalously cool eastern Pacific Ocean temperatures in January gave way to anomalously warm temperatures by April. Temperatures between 80W and 100W warmed further since April 14. The Climate Prediction Center announced an El Niño Watch earlier this year. The most recent update says the chances of an El Niño during the rest of 2014 exceeds 65%. There is no reliable prediction of the potential El Niño’s strength at this time. Without another westerly wind burst, an El Niño will likely not be very strong. Even moderate strength El Niños impact global weather patterns. An important detail is whether the potential 2014 El Niño will be an Eastern or Central Pacific El Niño (see figure below). Professor Jin-Yi Yu, along with colleagues, first proposed the difference in a 2009 Journal of Climate paper. More recently, Yu’s work suggested a recent trend toward Central Pacific El Niños influenced the frequency and intensity of recent U.S. droughts. This type of El Niño doesn’t cause global record temperatures, but still impacts atmospheric circulations and the jet stream, which impacts which areas receive more or less rain. If the potential 2014 El Niño is an Eastern Pacific type, we can expect monthly global mean temperatures to spike and the usual precipitation anomalies commonly attributed to El Niño. Figure 5. 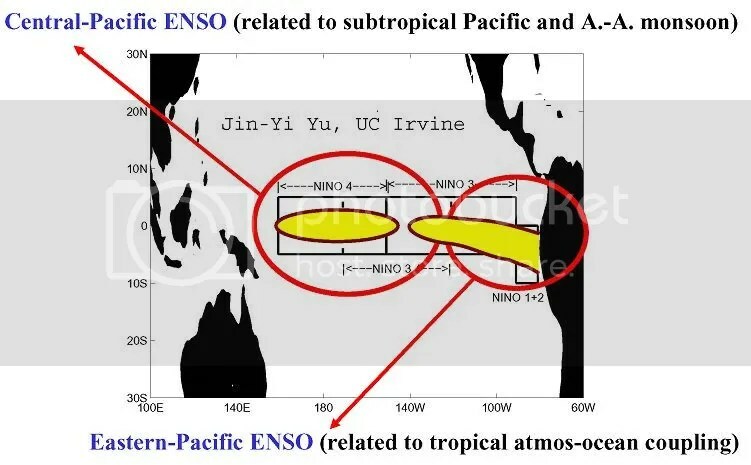 Schematic of Central-Pacific ENSO versus Eastern-Pacific ENSO as envisioned by Dr. Jin-Yi Yu at the University of California – Irvine. If an El Niño does occur later in 2014, it will mask some of the deep ocean heat absorption by releasing energy back to the atmosphere. If that happens, the second half of 2014 and the first half of 2015 will likely set global surface temperature records. 2014, 2015, or both could set the all-time global mean temperature record (currently held by 2010). Some scientists recently postulated that an El Niño could also trigger a shift from the current negative phase of the Interdecadal Pacific Oscillation (IPO; or PDO for just the northern hemisphere) to a new positive phase. This would be similar in nature, though different in detail, as the shift from La Niña or neutral conditions to El Niño. If this happens, the likelihood of record hot years would increase. I personally do not believe this El Niño will shift the IPO phase. I don’t think this El Niño will be strong enough and I don’t think the IPO is in a conducive state for a switch to occur. Skeptics have pointed out that warming has “stopped” or “slowed considerably” in recent years, which they hope will introduce confusion to the public on this topic. What is likely going on is quite different: since an energy imbalance exists (less energy is leaving the Earth than the Earth is receiving; this is due to atmospheric greenhouse gases) and the surface temperature rise has seemingly stalled, the excess energy is going somewhere. The heat has to go somewhere – energy doesn’t just disappear. That somewhere is likely the oceans, and specifically the deep ocean (see figure below). Before we all cheer about this (since few people want surface temperatures to continue to rise quickly), consider the implications. If you add heat to a material, it expands. The ocean is no different; sea-levels are rising in part because of heat added to it in the past. The heat that has entered in recent years won’t manifest as sea-level rise for some time, but it will happen. Moreover, when the heated ocean comes back up to the surface, that heat will then be released to the atmosphere, which will raise surface temperatures as well as introduce additional water vapor due to the warmer atmosphere. Thus, the immediate warming rate might have slowed down, but we have locked in future warming (higher future warming rate). 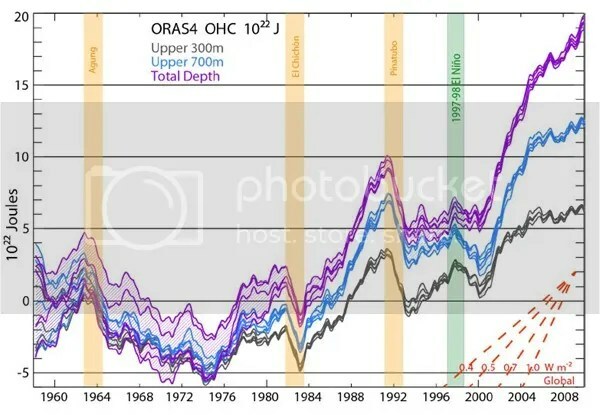 You can see in Figure 6 that the upper 300m of the world’s oceans accumulated less heat during the 2000s (5*10^22 J) than during the 1990s. In contrast, accumulated heat greatly increased in ocean waters between 300m and 700m during the 2000s (>10*10^22 J). We cannot and do not observe the deep ocean with great frequency. We do know from frequent and reliable observations that the sea surface and relatively shallow ocean did not absorb most of the heat in the past decade. We also know how much energy came to and left the Earth from satellite observations. If we know how much energy came in, how much left, and how much the land surface and shallow ocean absorbed, it is a relatively straightforward computation to determine how much energy likely remains in the deep ocean. The fact that April 2014 was the warmest on record despite a negative IPO and a neutral ENSO is eye-opening. I think it highlights the fact that there is an even lower frequency signal underlying the IPO, ENSO, and April weather: anthropogenic warming. That signal is not oscillatory, it is increasing at an increasing rate and will continue to do so for decades to centuries. The length of time that occurs and its eventual magnitude is dependent on our policies and activities. We continue to emit GHGs at or above the high-end of the range simulated by climate models. Growth in fossil fuel use at the global scale continues. This growth dwarfs any effect of a switch to energy sources with lower GHG emissions. I don’t think that will change during the next 15 years, which would lock us into the warmer climate projections through most of the rest of the 21st century. The primary reason for this is the scale of humankind’s energy infrastructure. Switching from fossil fuels to renewable energy will take decades. Acknowledging this isn’t defeatist or pessimistic; it is I think critical in order to identify appropriate opportunities and implement the type and scale of policy responses to encourage that switch. Categories: environment, global warming, NASA, NOAA, policy, science | Tags: climate change, climate change effects, climate policy, El Niño, ENSO, global temperatures, global warming, global warming effects, Jin-Yi Yu, La Nina, NASA, NASA temperature data, NOAA, NOAA temperature data, policy | Permalink.